A prayer circle with benches, flowers in planters, and a fire pit overlooking Lake Texoma now greets campers at Cross Point Camp. The serene spot to pray and meditate was built this summer by children attending New Day Camp I, a program related to the Conference’s Criminal Justice & Mercy Ministries (CJAMM). New Day is offered to Oklahoma children who have at least one incarcerated parent. Pre-teens attend New Day I, and youths ages 12-14 attend New Day Too. During camp, participants enjoy swimming, fishing, and other recreation, and they also perform a service project to "give back," said Kristen Harlin, director of CJAMM. Jeff Hiller, Cross Point’s director, suggested this year that the camp could use a prayer area, said Debi Self, one of the deans for New Day I.
Rev. Hiller helped secure donated materials for the project, and 69 campers, ages 8 to 11, were divided into teams to do the work. Lifeguards, who are a permanent part of Cross Point’s staff, supervised the project. The result was a circle of benches, constructed of concrete blocks and wooden timbers, near a fire pit built of rocks. The prayer circle is available to "everybody that comes to camp that wants to take advantage of it," Debi said. The site, with its view of the lake, is "the perfect place," said Carletta Denison, also a New Day I dean. The work took about a week, with each group of youngsters working a couple of hours a day. Building something like the prayer circle teaches the campers "to learn to serve others as well as to receive nurture," Debi said. Doing a project to help others allows the campers "to feel that sense of servanthood." "Everybody got to participate," Carletta said. The young campers were especially excited that they got to wear work gloves, and adult volunteers were thankful the gloves protected hands from possible wood splinters and the roughness of concrete blocks. When New Day campers return in subsequent summers, it will be "very fulfilling for them to see the fruits of their labor over time," said Debi. She has volunteered with New Day Camp for 22 years. From Moore, she is a retired speech therapist. She is proud to see the progress over time of New Day Camp participants who have become young adults even as their parents remain behind bars. Some of the campers have returned to give leadership in the program; working with adult leaders, some have completed paperwork for applying to college. "I think we’ve broken the cycle for some kids," Debi said. The service projects have varied over the years. One time the campers assembled personal hygiene kits to be distributed by the United Methodist Committee on Relief (UMCOR) to disaster victims, Harlin said. Another summer, the group prepared baby blankets to be given to an infant crisis center. CJAMM is supported by Apportionment giving. 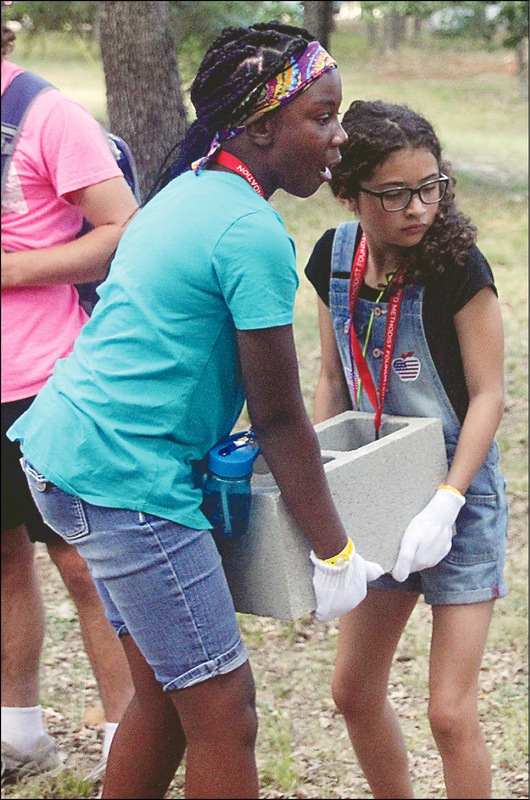 CJAMM New Day Camp I participants move a cement block as they help build a prayer circle at Cross Point Camp beside Lake Texoma.